December is a month when I tend to throw all of my routines out the window. All of the holiday goodies are too hard to resist, and with a crazy schedule during that time, I just can't hit the gym like I normally do. Instead of stressing myself out over every calorie consumed and every workout missed, I allow December to be my cheat month. Of course, I gained a few extra pounds last month, and even though I don't make any resolutions for the New Year, it's time to get back on track, eating healthier and moving more. I'll be swapping out those cookies for fruit, and pajama bottoms for workout pants in an effort to not only fit into my jeans better, but to feel better as well. One thing that keeps me motivated to workout is treating myself to a smoothie afterwards. 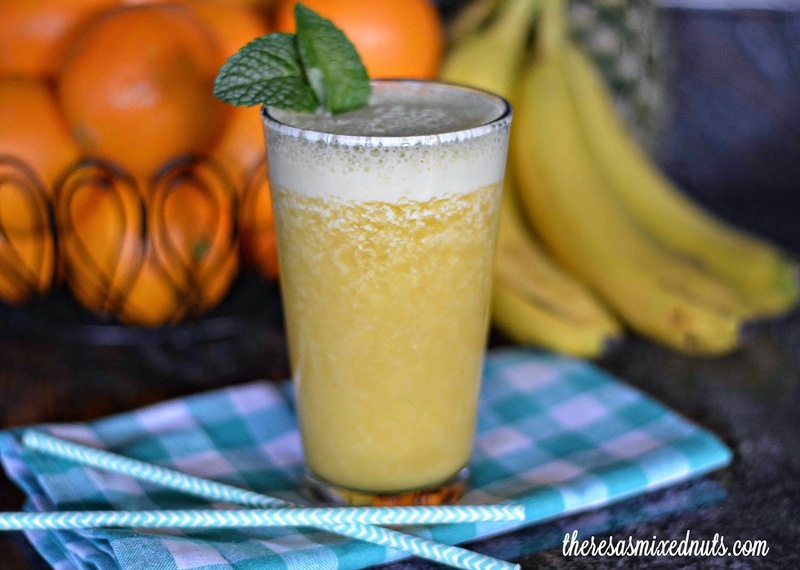 This Banana, Orange, and Pineapple Smoothie from Golden Blossom Honey is a favorite, tasting delicious and giving my body a boost of post workout vitamins and nutrients that it needs. 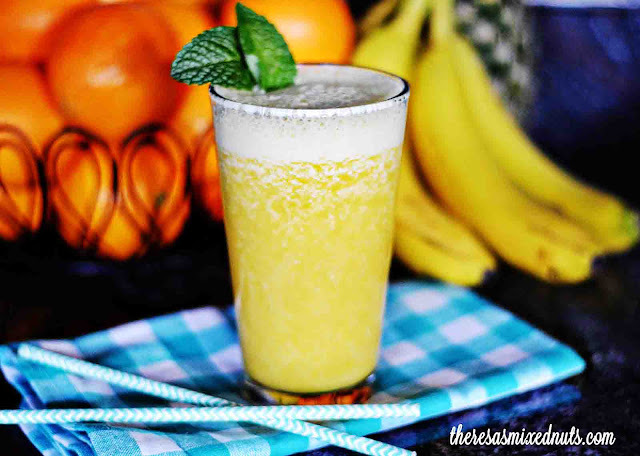 Place ½ cup of the orange juice, bananas, pineapple chunks and honey in a blender. Process until smooth. Pour into a pitcher. Stir in water and remaining 1 ½ cups orange juice. Chill until ready to serve. Stir well before serving. Garnish each serving with a mint leaf. * I like my smoothies a little on the thicker side, so I skip the water ingredient and serve as is. What are your favorite fruits to mix into your smoothies? How interesting. I have never added honey to any of my smoothies before, but I bet it's really good. I am going to try it this weekend. It's a great way to substitute for the sugar, which a lot of smoothie recipes call for. Adds just the right amount of sweetness! I drink the very same one each days for about ten years, minus the pineapple, and I don't blend them (since I don't like the taste the foam gives) but I mash the banana with a fork and squeeze the orange. And two spoons of honey always! You don't like pineapple, Dezzy? It's one of my favorite fruits to add to smoothies, next to strawberries. you mean five pieces of kiwi or five pounds for that price? 5 pieces. Say what about the lemon zest!? I haven't heard this! I have a lot of recipes that call for zest of lemon. I also love soaking them in my water. Yikes! That looks delish!!! I love putting mango in smoothies...I think it makes them even smoother! I looooove smoothies. I am even working on another recipe book for them. Lately I have been adding more citrus fruit. Whole new world of flavors. I'm like you, I like them a little thicker. Too runny and it just seems like juice! That looks amazing. Especially now that it's summer here, and we just came off a day that was 42 degrees Celsius (108 Fahrenheit). I am so jealous! It is freezing here, and I spend most days wrapped in a heated blanket. I can't wait for summer! My mom hates bananas in her's, but I have to have them. It seems like bananas and spinach are always the base in ours, with a mix of some other fruit to add more flavor. The girls aren't fond of bananas in theirs either, but I like how it thickens it up a bit. Though I can't do spinach. The color always throws me off. I make tons of smoothies. What kind of blender do you use? Is your blender available on Amazon? I'm looking for a good smoothie blender to buy my mom. Lesley, I use an old Magic Bullet that my husband bought me about 8 years ago. When it breaks I am thinking of upgrading to the Ninja blenders though, as I have heard really great things about them from other bloggers! 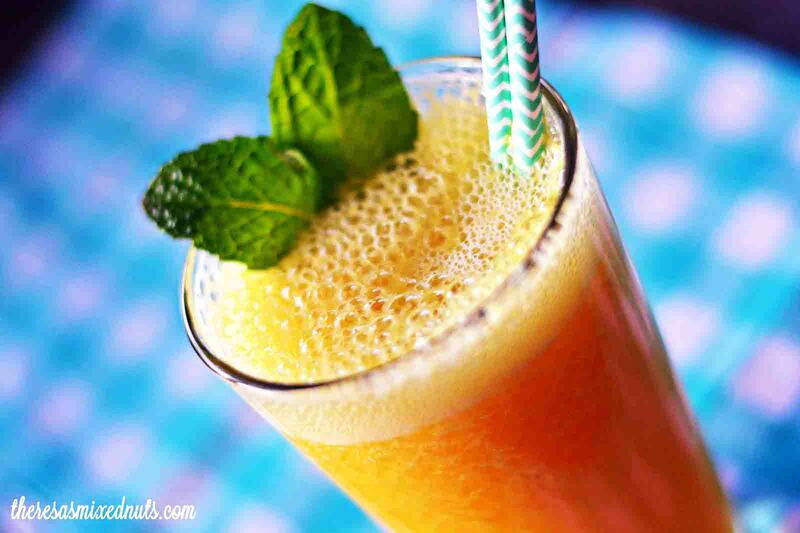 Orange juice and pineapple juice are an awesome combination--add a little honey--YUMMY. I would have to leave out the banana (allergy). I drink smoothies all the time and make protein shakes and even have made organge banana smoothies before but I love trying new combinations and the half oj divided I haven't tried with it yet usually I just use a can of oranges I bet this taste a lot better. I love smoothies Theresa. Sounds like a yummy recipe although I would probably skip the honey. I always find the fruit adds enough sweetness. Love all these flavors. Added honey is fantastic. That looks really good and easy to make, too. This looks delicious and refreshing. I love smoothies with bananas and OJ! How did I miss this post? Well, anyway - YUM! I like exploring new flavors with natural ingredients like this! Yum, yum, yum! I completely love adding honey to things and I have not added them to smoothies yet. I am trying this recipe soon! I love mixed fruit smoothies like this one. It's a delicious way to enjoy a fruity treat. Sounds like you should be sitting on a tropical island while you sip this. MMMMMMmmm good. I usually make blueberry and spinach smoothies, but this sounds delicious!